This photograph was taken at the DOD Retirement & Service Award Luncheon. The luncheon was held at the Hale Koa Hotel on September 22, 2006. 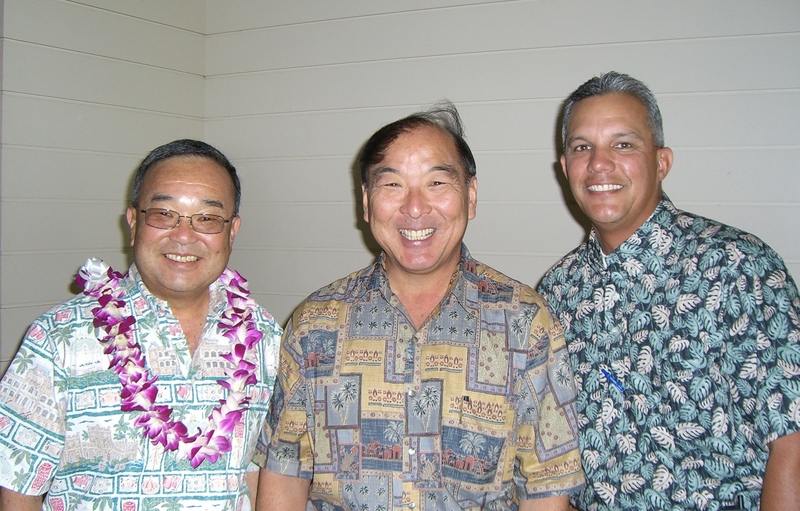 The photograph shows Irvin Yoshino, Preston Nishie, and Rob Lee. Irvin come to the Hawaii Air National Guard in the early seventies after serving in the Air Force. He served in the 154th Wing’s maintenance complex units his retirement. He retired as a chief master sergeant and was one of the recent retirees honored that day. Preston served with the then-169th Aircraft Control & Warning Squadron in the Operations Branch. He was a member of the squadron for many years. When he retired he was the NCOIC of Operations and a chief master sergeant. Rob was the 154th Wing Commander Chief Master Sergeant at the time of this photograph. in 2010, he became the Hawaii National Guard’s Senior Enlisted Leader. After his retirement, he worked in Governor Ige’s office and later at the State Department of Transportation. He currently is the Honolulu Station Manager for Southwest Airlines. Read the earlier Retiree News post. Three great Chiefs who served in the Hawaii Air National Guard.